Hello Peeps! We had a little va-kay while the sewing competition was happening but we are baaaccckkkk! Let me tell you how much I love gold especially metallic-gold so when I saw the gold tone silks that Fabric Mart had to offer I had to get a few shades. I have two shades one Hollywood-Gold for myself (yes I said myself) and this Gold-Black for Mori. 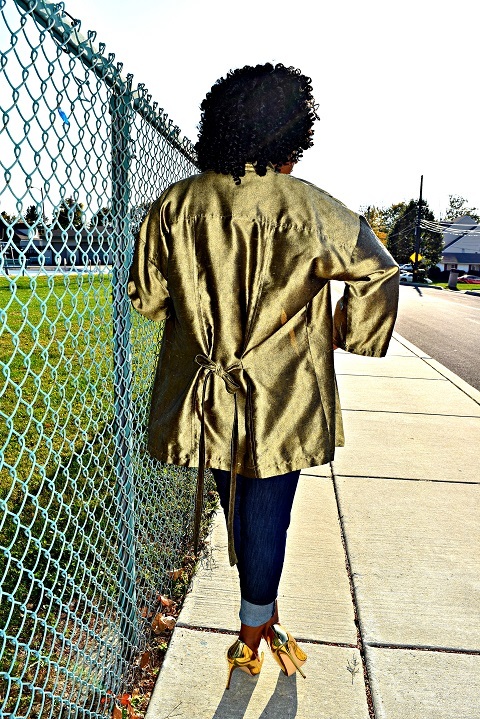 Now since this is a LUXE fabric the pattern needed to be simple, so I chose McCall's 7200 "Easy" kimono. I made view C with view B length. The pattern is very Easy perfect for a beginning sewist. It is a slim fitting kimono so if I use the pattern again I will add some width for a fuller look. I would also make my ties thicker, they are a little dainty for me. 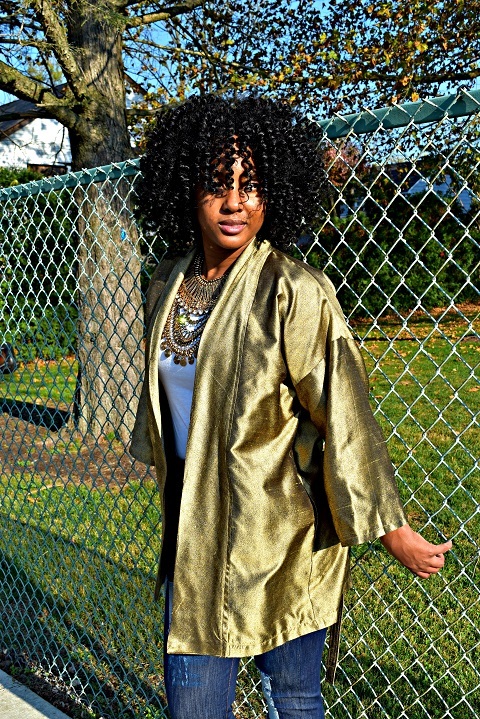 I love the look of this kimono because you can dress it up or down. 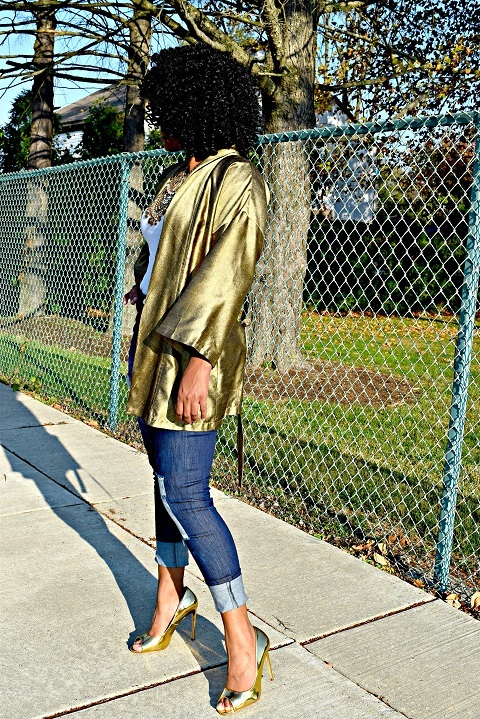 I topped my Golden look off with a pair of DIY distressed jeans that I made using Simplicity's 8222 #Mimigstyle pattern, a plain white t-shirt, these fabulous Gold open toe shoes and the statement of all statement necklaces. 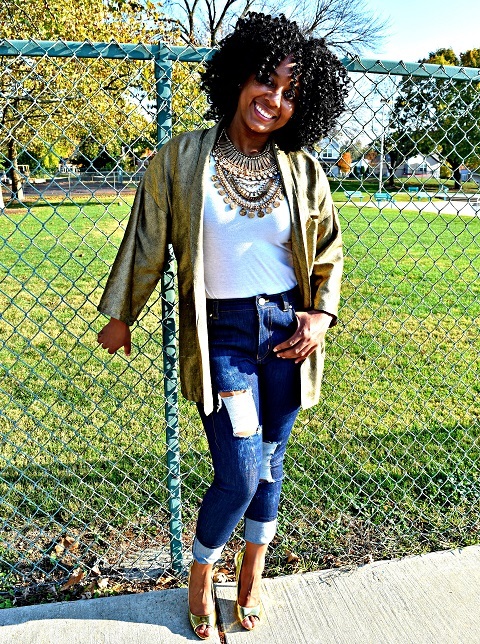 I hope you've enjoyed my golden look and are inspired to give gold a try! Love this! It looks really expensive. I never realized fabric mart has so many colors of dupioni! Any of the colors would look great with this jacket style, but my favorite is the Stone Gray/Black Variegated. Gorgeous! Thank you, fabulous fabric is a beautiful thing! 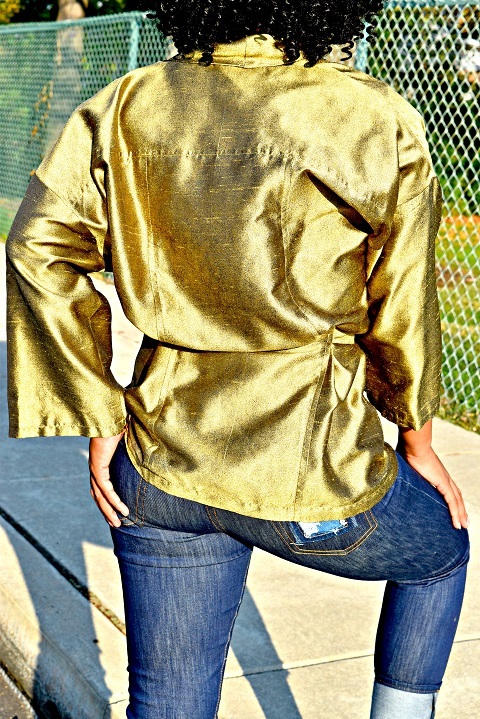 I've never seen gold metallic silk before. Fancy - I love it! Yeah Peggy we like to be fancy! You look adorable! I never think I have anything I want to sew in dupioni and FM also has the best ever colors and patterns of it. I have a similar pattern -- the Tokyo jacket from Tessuti and this gives me the best ideas!!!! 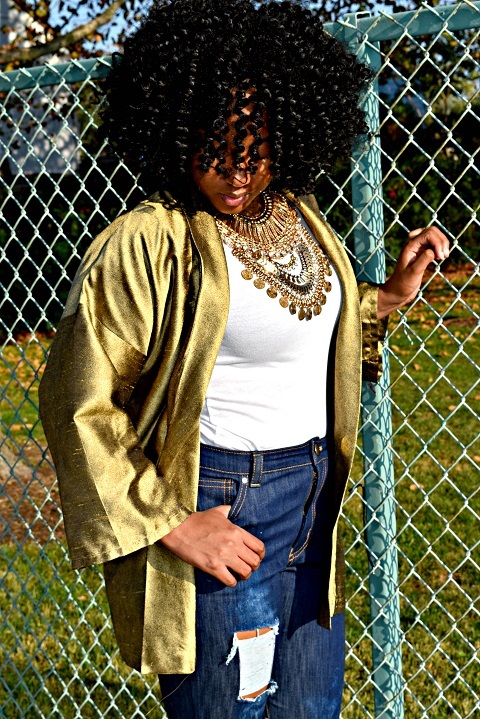 Thanks Colleen , that's my daughter Mori in this gold piece. Well, then SHE looks adorable! I actually ended up buying some dupioni yesterday in the sale. I have the Tessuti Tokyo jacket which is very similar. I can't wait until it gets here!!!! Thanks SO MUCH for posting this! Thanks Lora, did you subscribe to my newsletter? Beautiful! You did it again!!! Love it!!! 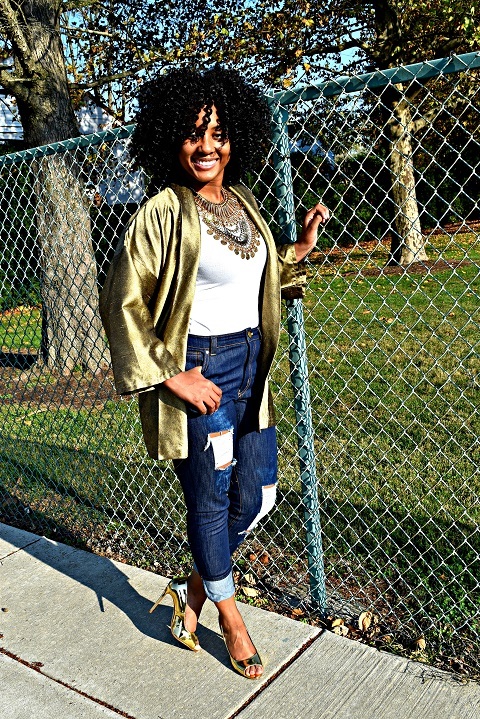 Gold is my favorite color and those shoes!!!! You did great and you look great also!! The whole outfit is just stunning! I love how the distressed jeans balance the jacket. Love, love, love this kimono.